Since I started this blog, the days of the week have been in sync between the current period and the one 50 years past; for instance, February 28 was a Wednesday in 1968 too. But now we run into the fact that, unlike 2018, 1968 was a leap year. This means that not only do we have to account for a day that does not exist in the current timeframe, but everything will be one day off from here on out. Well, so it goes. 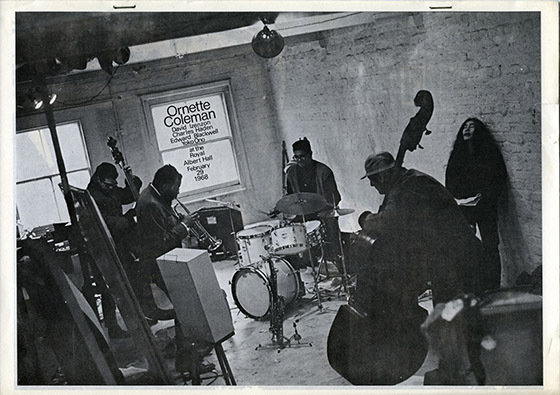 A check of The Beatles Bible indicates that on February 29, 1968, Yoko Ono was invited to join Ornette Coleman in a performance at the Royal Albert Hall. Which seems odd in itself, and the fact that this transpired on Leap Day made me think it must be some kind of prank. But as far as I can tell it was a real thing (see above). So here we have a true rarity, evidence that someone in the world other than John Lennon took Yoko seriously as a musician. The following version of the the Coleman/Ono collaboration, called “AOS,” appears on the Yoko Ono/Plastic Ono Band album. I am told that it is actually a recording of a rehearsal that took place before the RAH performance, but on the same day. It’s pretty, um, avant-garde; approach at your own risk.